Low-lying areas of the country have been hit by flooding with more than 200 families being displaced while 52 houses and a secondary school were destroyed in Mashonaland Central. One person was reported killed while another was missing after being swept away by flooded rivers as rains continue to pound the country. This brings the number of people who have died so far due to the floods to 10. Eight family members died on Saturday when the car they were travelling in was swept away while crossing a flooded Ngwazani River near Kadoma. Their bodies were found yesterday trapped inside a Honda CRV in the river. In Mashonaland Central province two people were marooned with 52 houses and a secondary school destroyed by the floods. “In Mbire district, 37 houses collapsed including Makuwatsine Secondary School buildings. At least 15 houses were flooded in Mukumbira, Mt Darwin while 200 families were displaced and had to be housed at Kanongo Primary School,” Mashonaland Central provincial administrator Mr Josphat Jaji said. Mr Jaji said a woman had been swept away while trying to cross Bwazi-Munozi River in Mbire, where two other people are currently marooned with her fate still not known. He said the situation was getting worse in the three districts as the rains continued to pound. Four boreholes have been contaminated in Muzarabani, Mbire and Mt Darwin. The Meteorological Services Department has warned that the rains will continue throughout the country. In Hopley, Harare South constituency, several houses collapsed while a six-year-old child died after she was crashed by a wall that fell when a house in which she was collapsed. National police spokesperson Chief Superintendent Paul Nyathi yesterday confirmed the death of the minor. “Police have attended to a report were a six-year-old minor died on January 2 when a wall collapsed on her following incessant rains. No report has been made concerning 11 other people said to have also died in the area,” he said. Harare South House of Assembly member Cde Shadreck Mashayamombe had told mourners gathered at the burial of the child that 11 people had died in his constituency. Mr Jaji said they had conducted a provincial Civil Protection Committee meeting where they reviewed reports on the situation in Mbire, Mt Darwin and Muzarabani districts. “Nyambudzi Clinic has been affected by the rains and people are receiving treatment at a nearby primary school while villagers in the Chikafa area and a police base have been moved to higher ground. Mr Jaji said efforts to reach the affected areas were being hampered by the roads which have become impassible. Mr Jaji said 21 people who were marooned from Saturday afternoon to yesterday morning were reported to be safe as water levels had subsided. He encouraged people in the province to immediately alert local disaster committees chaired by councillors. Twenty-four homes were destroyed in Zvimba and Chinhoyi in Mashonaland West province resulting in the displacement of the families who are now in urgent need of relief. The rains which fell since Friday also caused the flooding of roads with the Harare-Chirundu and Lions Den-Mhangura roads being the worst affected. At least 16 homes were destroyed in Mucheri village under Chief Chirau. Mashonaland West provincial administrator Mr Christopher Shumba said the affected families were in urgent need of food and tents. “We have 16 homes that have been destroyed in Mucheri Village and eight others in Two Tree and Gudubu areas. Families are in the open and they need assistance,” he said. About 15 people suspected to be gold panners marooned in Angwa River were rescued yesterday by the police Sub-Aqua Unit. Another person marooned overnight and perched in a tree at Royal Bucks along Angwa River was also rescued yesterday. Red Cross provincial officer Mr Amon Choba said the society was appealing for help after assessing the situation on the ground. “We are still assessing the situation on the ground with a view to engaging our head office for assistance,” he said. There are fears that the Angwa Dam, which caused the floods that led to the blockage of the Harare-Chirundu and Lions Den roads for the better part of Sunday, could burst. A team has been set up to assess the state of dam walls and bridges in the area. 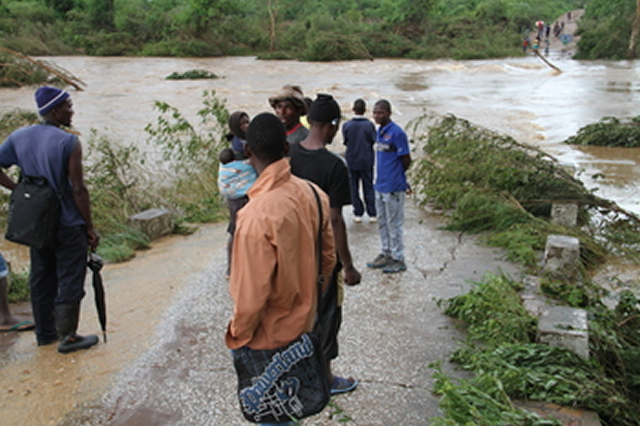 In the aftermath of the rains, roads and bridges, especially Chikuti, have been damaged. Hundreds of motorists and travellers were left stranded after Denga River overflowed the Harare-Chirundu Road with one truck being swept off the road. Civil Protection Unit operations officer Mr Godfrey Nyoni said his organisation would act accordingly after being presented with details on the affected areas. “We have contacted Mashonaland Central and Mashonaland West provincial administrators to give us feedback on the information on the ground. “We do not operate in isolation. After being presented with factual information we will act accordingly to see the needs and damages,” he said. He said motorists and pedestrians should not cross flooded rivers. “We are advising all motorists and pedestrians not to cross flooded rivers or crossing points even when they are familiar with them,” he said. Meanwhile, Ministry of Environment, Water and Climate permanent secretary Mr Prince Mupazviriho has ordered the Zimbabwe National Water Authority catchment managers to work with the CPU. “Due to the incessant heavy rains that are being received in all parts of the country all catchment managers are being directed to monitor and report flooding in dam basins and low-lying areas. “Catchment managers are further directed to monitor and report the safety of all dam structures both complete and under construction,” he said.